The Phage Art Exhibit was envisioned as a way to celebrate the long history of phage research. 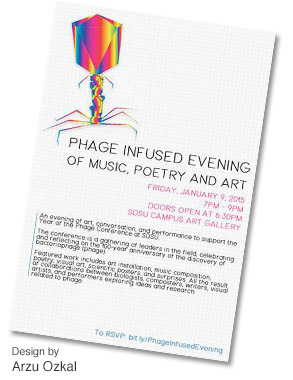 A first of its kind at SDSU, five colleges (Sciences, Art and Design, Arts Alive, Music and Dance, and Arts and Letters) collaborated to create phage-related projects that marry art and science, changing our perspective of these viruses. With this interdisciplinary collaboration, we wanted to explore what diverse thinkers in various fields can bring to each others' disciplines—challenging long-held views, opening up new possibilities of research and exploration, and enhancing the wonder of these tiny but fierce predators.